Everest Base Camp trek in February Doable? Home / 10 Best Treks in Nepal – The Ultimate Guide for Trekking in Nepal / Everest Base Camp Trek in 2018: The Ultimate Guide / Everest Base Camp trek in February Doable? February is the door that lets you go from the autumn to spring. The chill of the winter transforms into the beauty of spring in this month. So this might be the month that makes your dream of the Everest Base Camp all the more worthwhile. You’re bound to think that the trekking trail of Everest Base Camp is a tad cold in February. Undoubtedly true! February, needless to say, is not as warm as the summers. So, you won’t be able to enjoy the daytime temperatures of around 20 degrees as in the summers. It is not unbearably cold either. The nights are definitely cold but the temperatures can go as high as 5 degrees. And with proper packing, this temperature is more than bearable. In fact, for trekking standards this is normal. And what you can’t discount is the beautiful views that you get in the month of February. The mountains and the clarity is unparalleled. Many travelers and nature photographers have described February as an ideal month. Why Everest Base Camp Trek in February Makes a Lot of Sense? February is a unique month in the trekking region. It is not possible for you to quantify the temperature throughout the month as a single quantity. You have to take into account the transition from the winter to the spring. In the early parts of February, the daytime temperature has an average of around 8 degrees. This temperature is pretty warm considering the fact that you walk around the daytime. Thus you’ll have a warm trekking experience. In the latter parts of February, post-Valentine’s day, the average temperature hovers around 12 degrees. 12 degrees is more than warm. It is the average temperature in February even in the valleys of the country such as Kathmandu and Pokhara. 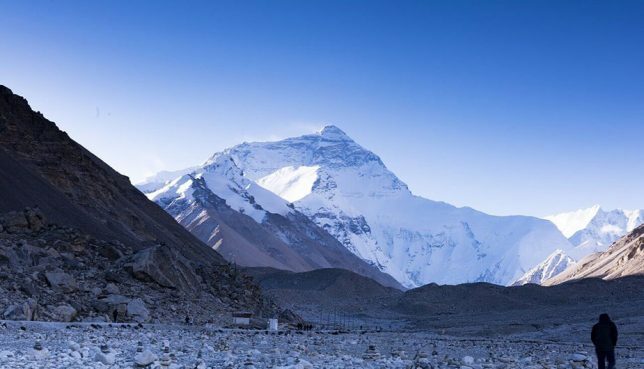 If you go trekking to the Everest Base Camp in the early parts of February, you should expect the average temperature to be around -3 degree centigrade. Yes, this might be the case for some days but not always. The temperature can be as high as 1 degrees as well. And if the temperature gets low, it can get as low as -10 degrees. Don’t worry. There are various ways that you can get yourself accustomed to such cold climate. In the latter parts of February, the average temperature of the nighttime can get a high as 5 degrees as well. 5 degrees is quite high a temperature and can be resisted by people of all ages. One thing that people don’t take into account while looking at the climate of a place is the wind. At such altitude, the wind might also make flights as well as treks difficult. But February wind doesn’t blow in a harsh way. 8-12 miles per hour is the range of the velocity of wind that blows in this month. 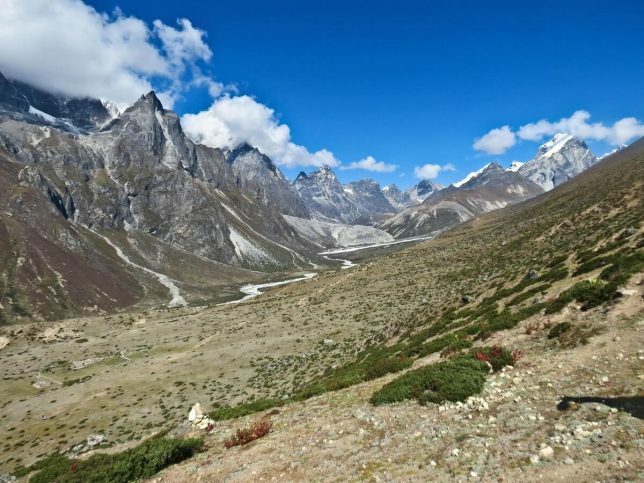 One thing that has happened with the number of tourists that fly to Nepal to visit the Everest Base Camp is that there are various trekking packages available to people. It all depends upon the number of days you are willing to put in the trek. Gokyo to Everest Base Camp trek is a circuit trek to Everest Base Camp. 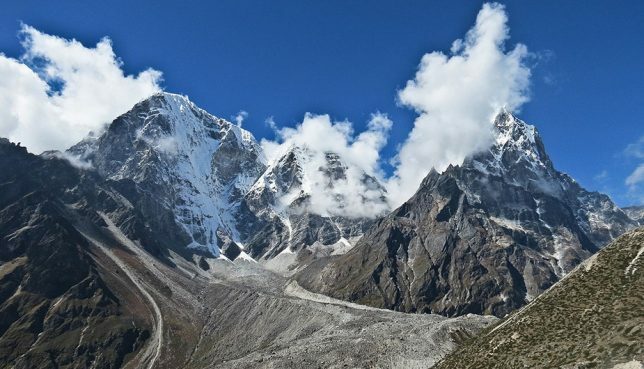 It ranks as the trek that is one of the most adventurous in Nepal. You’ll get to go to Gokyo, a place that is mesmerizing with lakes and located at the foot of Gokyo Ri. You’ll get to have plenty of rest as acclimatizing is an important aspect of trekking to mountains. You’ll spend around 19 days in this trek. This time also includes you taking flights to and from the Kathmandu valley. There are various passes in the Everest Region that you should undertake in order to have a wonderful experience. These passes include Cho La Pass as well as Kongma La pass. Both of these passes are located at an altitude of more than 5000 meters. Classic trekking routes include taking you to the Lukla airport from Kathmandu valley and start your trek from thereon. But the Jiri to Everest trek is one of the best if you are looking for good ways to acclimate your body to high altitude. You’ll start your trek from Jiri, a place in the scenic Dolakha district. This place is located at an altitude that is less than 2000 meters. Lukla is around 3000 meters. So people who have had problems of acclimatizing before or are fearful that acute mountain sickness might affect you, start your trek from Jiri. 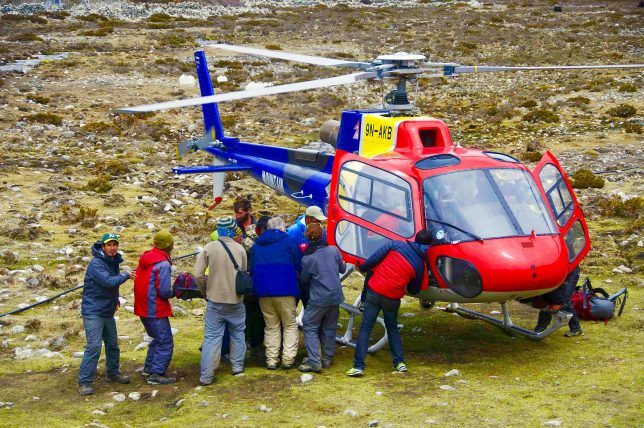 Helicopter trek is a way to reduce the time that you allocate to trekking and therefore is a very good way of not experiencing the February cold for a long period of time. The Helicopter trek has a moderate level of difficulty. 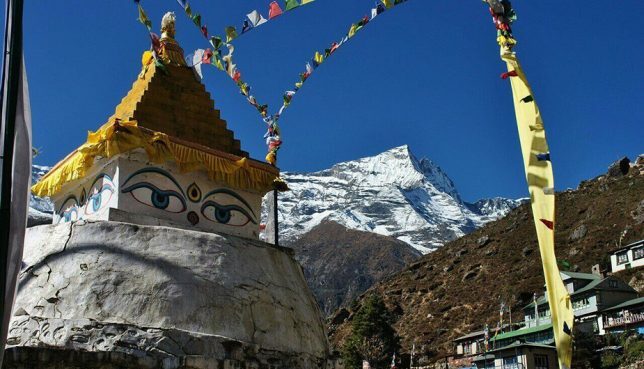 You will get to trek around Namche Bazaar and get to the highest point of 3400 meters. And to go to the Everest Base Camp or Kala Pathar, you’ll get to ride in a helicopter. This way you’ll save time, not trek extensively and get the opportunity of riding in a helicopter too. 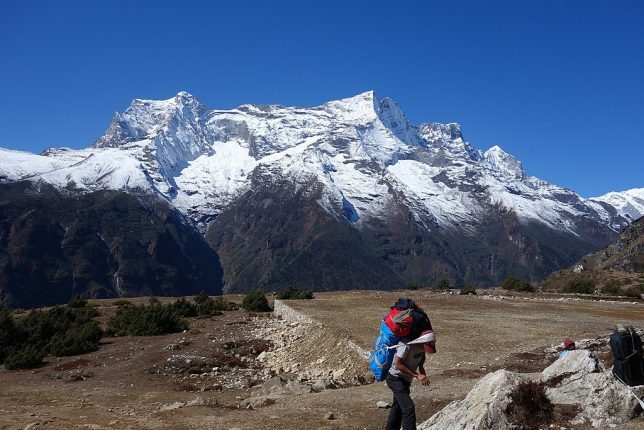 The island peak climbing is one of the best treks in the Everest region that you can undertake because it gives you a wide range of places to go. Not many people know that the Everest region has another Base Camp that you can go to. It is called the Island Peak Base Camp located at an altitude of 5240 meters. You will also go to Gorak Shep and Kongma La pass. The Island peak will also be there for you to scale. The February trip is relatively cheap. As many travelers don’t trek around February, you are likely to get a discount on flight tickets as well as accommodation. You also won’t have to worry if you will be able to secure a ticket to and from Lukla. Flights are almost empty. Views of the mountains are everything. They are what make a trip worth all the trouble. And that is exactly what you are expected to get in the month of February. 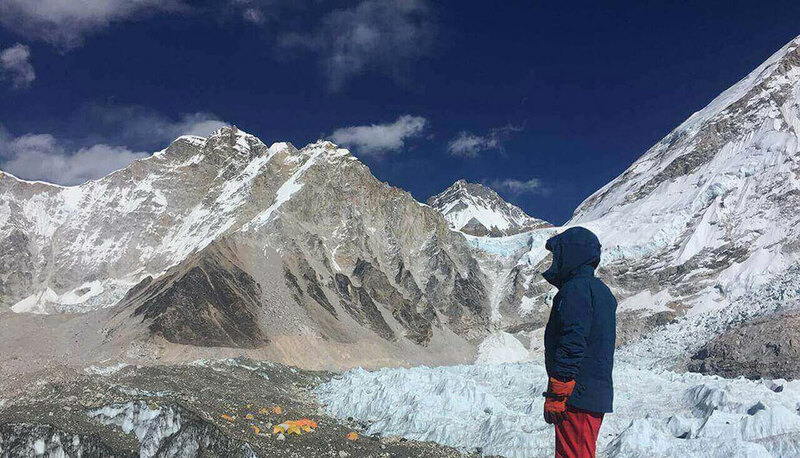 With practically no cloud covering of the mountains and no fuzzy views, everyone is excited to trek in the Everest Base Camp region at this time. And why not? Traffic is what comes to mind when it comes to enjoying a place. The more crowded a place, the less you can admire it in its true beauty. You won’t have to worry about that when you visit Everest Base Camp in the month of February. You’ll get to experience this peak in solitude and be as close to nature as you possibly can. You’re not supposed to forget the importance of good training before you come to Everest treks. The physical strength you have to show is of great significance when coming to Everest region. So train accordingly. And maintain a healthy diet. Diet, which consists of balanced food and proper intake of water should be regulated. The habit of proper diet comes in handy when dealing with altitude where an improper amount of water and food might bring about altitude sickness in various forms. A backpack to carry all your belongings. Backpack chargers as solar chargers might not work well in the February cold. A good pair of trekking boots. Have ones with spikes to maintain a firmer grip in case it snows. Creams, lotions and moisturizers that will protect your skin from the unpredictable temperature of the Everest region. Sunglasses as the thin atmosphere will not be able to protect your eyes from the UV rays. High intake of food as well as water to maintain the engine of your body. Going slow and letting your body acclimatize to the climate as well as the altitude. Appropriate sleep that should be increased as you travel higher up the altitude. Letting your friends and family know your positions and keep your devices working. As there won’t be a lot of people, don’t go to places that are not recommended by your guides or porters. Fear is what brings a lot of people down when it comes to trekking the Everest Base Camp region in February. But if you read the points above and consider things yourself, you’ll know that February trek is not as hard as people make it be. So, what’s the fuss all about? Prepare well, eat well, trek well, go slow and make the most of your time. With these smart ways of making the Everest trek a reality, why should you miss out on the glorious Mount Everest in the month of February?